Effective detection and monitoring tools are essential to manage the major ecological and economic problems posed by alien conifer invasions. Low-cost aerial imagery has been promoted as a promising tool for the detection of alien trees over large landscapes, but as yet there have been few attempts to assess its reliability for monitoring invasions. In particular, studies have not yet examined how well aerial imagery can detect densities of trees across invasions. 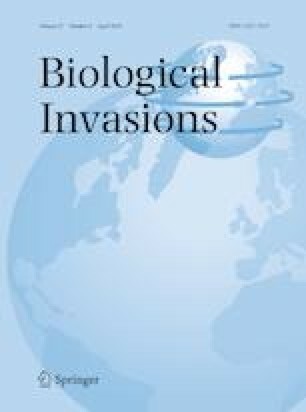 To evaluate this, we used freely available, high-resolution aerial imagery to examine how age structure, spatial patterns and density of alien conifers varied across an invasion front. Overall, we were able to detect both the spatial pattern and distribution of trees with canopy diameters greater than 2.5 m, but we could only detect smaller trees with certainty where they were found at low density. These results point to aerial imagery being suitable for detecting trees at the edge of the invasion front, where they are often small and at low density. While assessments of the overall age-structure will underestimate the number of small trees, the number and spatial pattern of larger reproductive individuals can still be adequately captured. Thus low-cost aerial imagery can inform managers of where best to target control efforts at the invasion edge and also the location of large reproductive trees that are likely to contribute to future population expansion. The online version of this article ( https://doi.org/10.1007/s10530-019-01960-8) contains supplementary material, which is available to authorized users. The authors would like to thank Land Information New Zealand (LINZ) for providing the aerial imagery. We also are grateful to Nick Ledgard and Gordon Baker for their permission to access the Mt Barker Forest. We are indebted to Johnathon and Brendon Ridden for their many hours of help with fieldwork. Finally, we are grateful to the Bio-Protection Research Centre at Lincoln University for its research support. This work was supported by the Miss EL Hellaby Indigenous Grasslands Research Trust, New Zealand.